We’d love your help. Let us know what’s wrong with this preview of Stargazing for Dummies by Steve Owens. Stargazing For Dummies offers you the chance to explore the night sky, providing a det Reach for the stars Stargazing is the practice of observing the night sky and its contents - from constellations through to planets and galaxies. Stars and other night sky objects can be seen with the naked eye, or seen in greater numbers and in more detail with binoculars or a telescope. Stargazing For Dummies offers you the chance to explore the night sky, providing a detailed guide to the main constellations and also offering advice on viewing other night sky objects such as planets and nebulae. It's a great introduction to a fun new hobby, and even provides a fun way to get the kids outside while doing something educational! To ask other readers questions about Stargazing for Dummies, please sign up. This is one of those books that's closer to a manual, it actually can come real handy when a person is about to go on a stargazing adventure. A good guide for beginners. Covers the basics for an enthusiast to get off the ground. Has the basics of celestial motion, Binoculars, Telescopes, and cameras and how to work them, finding your way around the sky and the sights to see in the official constellations. 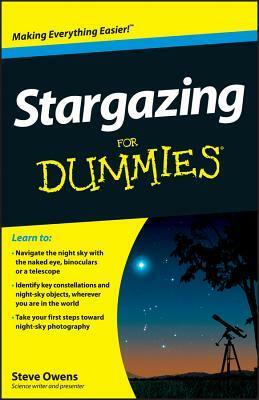 Disclosure: I am a For Dummies Ambassador and received Stargazing For Dummies to review. All opinions are my own and the review link is below. Very interesting and an easy read, although the numerous typos became a bit annoying.